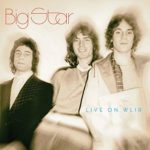 It’s hard to imagine this album having the same sort of revelatory impact in a world now populated by multiple live sets, demos, rehearsals, alternate takes and mixes, a reformed band, new material and posthumous tributes; yet, it remains one of the preeminent artifacts of Big Star’s first run, and an essential element of the canon. Recorded at Hemstead, New York’s Ultrasonic Studios for broadcast on Long Island’s WLIR, the band shows off a three-piece lineup of Chilton, Jody Stephens, and Andy Hummel’s replacement on bass, John Lightman. The material is drawn from both #1 Record and the then-recently released Radio City, with the lion’s share from the latter. The performances are loose, with Chilton energized in both his singing and guitar playing – perhaps not yet realizing that Big Star’s commercial fortunes were about to flatline for a second time. This entry was posted on Thursday, February 7th, 2019 at 11:17 am	and is filed under CD Review, Reissue. You can follow any responses to this entry through the RSS 2.0 feed. Both comments and pings are currently closed.